Several Iranian public figures have criticized Rouhani admin officials for blaming the victim in a video of a woman being assaulted by Iran's morality police. Journalist Fatemeh Jamalpour tweeted: "Some of the reactions have been more upsetting than the incident itself. The interior minister called the woman 'foul-mouthed.' Ebtekar said the incident was 'attributed' to the Guidance Patrol. Mowlaverdi said the way the agents had dealt with the woman's 'improper clothes' was problematic, which means she believes there are good and bad kinds of clothes. Then Tayebeh Siavashi claimed that violence had decreased under the current administration." Actress Taraneh Alidoosti shared the video on her Twitter page and wrote: "Pulling people's hair and headscarf is not guidance. [The offending agent] is an insult to women and humanity. Choking people's kids to enforce your values is not guidance. It's savagery! The Guidance Patrol [Morality Police] represents oppression, despotism and barbarism. We've seen these scenes in prior years. Please don't pretend you're shocked and going to confront the offender." The public outcry over the video posted on social media networks on April 18, 2018-of a woman being hit and dragged by a morality police member for allegedly failing to wear a proper hijab-resulted in calls by officials for an investigation. But while some Rouhani admin officials criticized the morality police's conduct, many also suggested the victim shared responsibility for failing to properly observe the hijab. Iran's volunteer "anti-vice" squads, also referred to as the "morality police," are particularly busy in the hot summer months when Iranian women are less observant of the mandatory hijab, the head-to-toe Islamic dress code that women are expected to observe at all times in public in Iran. "We witnessed these kinds of blatant acts of violence against women during the Ahmadinejad administration but less so in the current one," tweeted reformist Member of Parliament (MP) Tayebeh Siavashi. After some users criticized Siavashi for making the comparison, she posted a follow-up tweet, this time describing the vice patrol's behavior as "very regrettable." She added: "I contacted the legal affairs deputy of the police force, Gen. Eshragh, who said 'our agents acted wrongly. We had issued orders that if there's resistance, agents should let go. The police will quickly investigate this matter.'" President Hassan Rouhani (2013-present) was voted in on a campaign of "hope and prudence," promising a more open society with an emphasis on upholding human and civil rights. Police spokesman Saeed Montazer al-Mahdi responded by saying "the police never condone such behavior but added that the video was only "part of the whole truth" and advised women to "observe ethical and social norms." Describing the agent's conduct as "out of order" in confronting "a foul-mouthed woman," the Interior Ministry announced that Interior Minister Abdolreza Rahmani Fazli had asked the police to conduct a "thorough investigation" and submit a report by April 20. President Rouhani's top female cabinet members condemned the morality police squad's behavior but also subtly defended the agent, who was allegedly "insulted" by the victim. "A film has been published on social media attributing an action taken regarding the hijab to the Guidance Patrol [morality police]. How can such conduct be justified? What are the operational boundaries for agents - even when they are insulted? I strongly condemn this confrontation and will look into it. These violent and irreligious behaviors are not becoming of any human being," tweeted Vice President for Women and Family Affairs Masoumeh Ebtekar. Shahindokht Mowlaverdi, the vice president for citizens' rights, blamed the woman for failing to observe the hijab, but added: "The publication of a clip regarding the manner the police tried to advise a woman of her bad choice of clothes has, more than ever, emphasized the need to change the methods used by cultural and law enforcement agencies from 'compulsion' to 'understanding,' from 'propaganda' to 'thoughtfulness,' from 'superficiality' to 'substance' and from 'marginal activities' to 'impactfulness,' and a reminder that these steps were part of the 11th government's (2013-2017) cultural program." "I thank the interior minister for stepping in and reacting quickly and I deeply believe that we have to follow a new approach in the age of communications," said Mowlaverdi. Social media users criticized former reformist presidential candidate Mohammad Reza Aref for equating the hijab with a woman's "dignity." "The dignity and worth of my country's girls should not be destroyed by the arbitrary actions of some individuals," tweeted the Tehran-based MP. "I am certain that the educated women of our country will also make an effort to preserve their dignity..."
Journalist Hossein Bastani tweeted: "Agents had gotten used to dragging people away and assaulting them without anyone finding out. Now people on social media are finding these cases and drumming up attention in every corner. This goes to the bottom of why the authorities are against the internet." Journalist Ali Malihi wrote: "In 2009 we chanted, 'No, no to the Guidance Patrol government' but the truth is that elected bodies don't have the power to stop the Guidance Patrol or the compulsory hijab regulations. There's no other way to confront apartheid other than by civil disobedience and resistance." "Why should the police come under scrutiny just because one agent made a mistake in enforcing the hijab?" he said in his sermon on April 20. "The entire government has come to the defense of a woman who was not wearing a hijab." 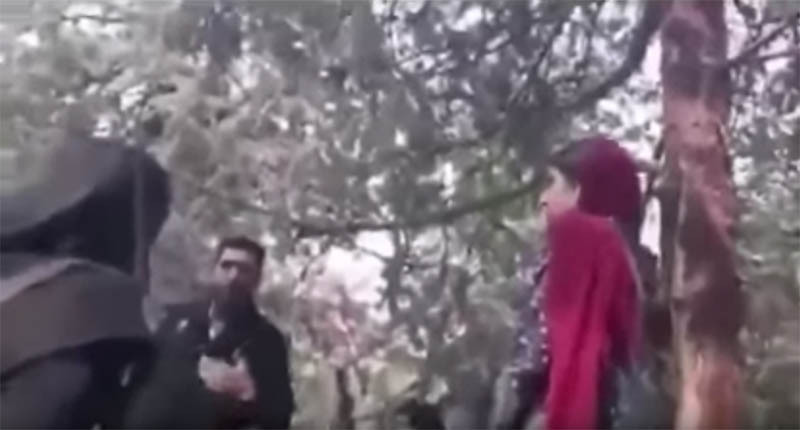 "Investigations by our Fars reporter revealed that the incident took place on April 9 at Taleghani Park in Tehran, nine days before the video was published, which indicates that the young girls had planned it in advance," said the report. Without providing evidence, Fars claimed there were four women in the park at the time of the incident and only one of them resisted by breaking a squad member's finger and scratching her face. "As soon as the video was widely published, some politicians saw an opportunity to come forward and take a stand against the Guidance Patrol without knowing the details of the incident," said the unsigned report by Fars.